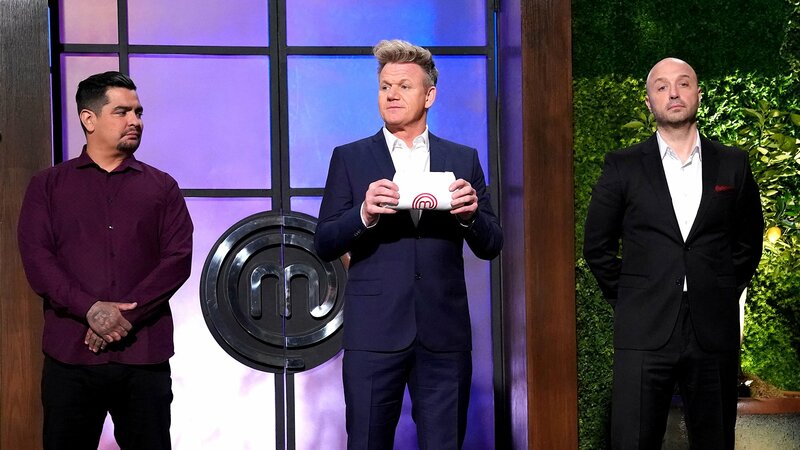 In a MasterChef kitchen first, the judges – led by host and award-winning chef Gordon Ramsay – will choose their favorite home cooks and mentor them throughout the competition. 43 home cooks compete in the Battle of the Apron challenge, and face off to earn a spot in the Top 24. The Top 24 are chosen and then in the first mystery box challenge, they make a dish featuring an ingredient unique to their home states. In the first skills test of the season, Gordon Ramsay teaches the home cooks how to break down a crab, before they must replicate his work. The Top 20 venture out of the kitchen and head to the historic Anheuser Busch brewery in LA for their first team challenge of the season. The contestants must create a dish using walnuts, and American soccer legend Alexi Lalas makes a special appearance. The contestants head to Malibu to cook for Season Seven MasterChef winner Shaun O’Neale’s wedding – with Gordon Ramsay officiating! The contestants face a mystery box filled with fresh seafood, and must create a dish using two items from it. The remaining home cooks pair up for a skills test to create a restaurant-quality dish featuring five ingredients. The Top 14 contestants are split into two teams to compete in a fine dining challenge and cook 39 dishes for a group of discerning judges. The Top 13 contestants face a mystery box challenge with a stockpot and cooking oil and must make a dish that features a deep-fried element. The Top 12 face their third skills test in the MasterChef kitchen and replicate the proper way to break down a halibut. The remaining home cooks split into two teams and are tasked with serving 100 dishes to hungry airmen. The seven remaining home cooks divide into two teams and race against the clock to serve 25 California firefighters. The top 6 face the restaurant takeover challenge and the remaining 5 receive a heart-warming mystery box challenge. The top 5 face a series of skills tests using beef; then the final 4 cook an entrée for the judges' mentors. The three remaining home cooks must each prepare a three-course menu for the judges. The home cook with the best overall menu wins the prize and the coveted title of MasterChef.